We are a team of volunteers helping to protect and enhance our natural surroundings by looking after the coastal park and foreshore in the Isle of Grain. The coastal park is an ideal location for ramblers, dog walkers, fishing and admiring natural habitats and wildlife. The Friends work in partnership with St James' Isle of Grain Parish Council. You can contact us at graincoastalpark@ymail.com if you would like to join our group. 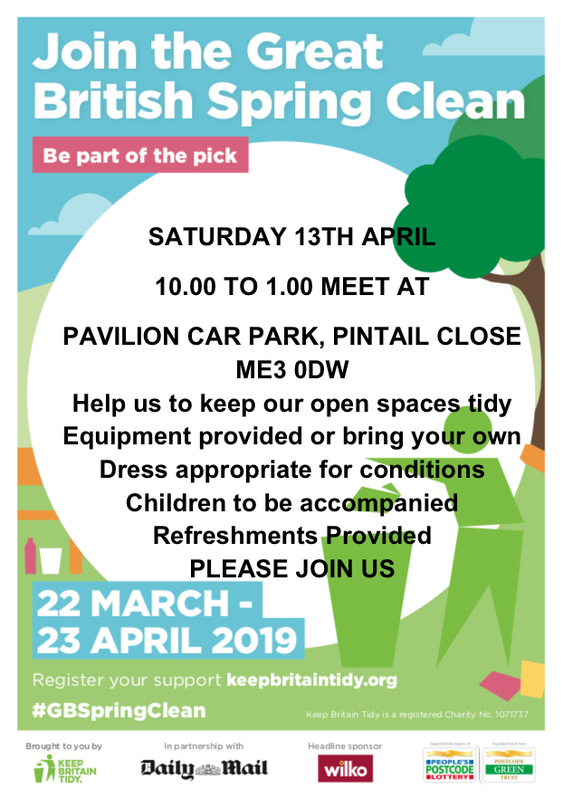 The Great British Spring Clean is coming to Grain Coastal Park on Saturday 13th April 2019 between 10am and 2pm as part of the Keep Britain Tidy campaign. Please come along and get involved! We will meet at the Pavilion Car Park, ME3 0DW at 10am. Equipment and hot refreshments will be provided. Click here for details of Michael Dale's tour dates. These are very popular and generous donations from attendees have enabled us to purchase tools and equipment for the group. We have also been able to make contributions to groups within the village from the funds raised.